Despite fleeting fallacies and crafted controversies inordinately crated to fall him from grace, one can only accept, in the face of hard facts, that the Bukola Saraki-led Nigeria Senate is the best the Nigerian nation has known since independence. Even when one considers the highly dynamic and effective leadership he currently offers the country as the President of Senate and the listed of laurels and achievements recorded during his reign. About the least of these great achievements but the most recent is the passing into law the the bill enabling the Independent National Electoral Commission, INEC, to conduct elections into the local government areas in the country and the bills enabling younger Nigerians to be fielded for executive offices at elections. It’s soul lifting for the country and citizens who have over the years can now be effectively part of the country’s adult suffrage, they can go to their respective wards and local government areas to contest for Councillorship and Chairmanship seat without one ambitious state governor manipulating the system against them. Saraki has scored high goals as President of the Senate in manners that even his fiercest detractors and critics cannot wish away. He has used the instruments of his office to wrought great change in Nigerian’s young democracy despite his political trials, in a way that has come to label his critics as enemies of the burgeoning new Nigeria, yet, Dr. Bukola Saraki is unperturbed by the serial political constraints , including the decision of the federal government try him at Code of Conduct Tribunal and also, upon his landslide victory, to file an appeal against the ruling of the Code of Conduct Tribunal (CCT), which upheld the plea of ‘no case submission’ he made on the 18-count charge of false asset declaration preferred against him. Just as believed by many Nigerians, his enthusiasts say confidence to the effect that the verdict of the Appeal Court would not be different from that of the CCT, as the facts of the case remain the same and the grounds on which the CCT based its decision to acquit him, remained unassailable. It’s believed that the appeal was nothing but another attempt to grandstand and embark on a media trial without any substance. As at today, it’s evident that some desperate persons in government and their collaborators outside are bent on pulling Saraki down at all costs, even if doing that would destroy the institution of the judiciary in the process or even hamper the democratic process. Little wonder they sponsored stories of allegation of bribery in the media against the Tribunal judges. Yet, all of these distractions and antics are aimed at perverting the course of justice and cog the wheels of democracy are obvious, but the sponsors forget easily that Nigerians are not fool’s. Though, one is conscious of the fact that the anti-graft agency and its ally bodies are frantically looking for a poster-case to sell its anti-corruption campaign, and there is the hunger for conviction in a celebrated case to advertise in the international arena government’s determination to pursue the anti-graft campaign, it’s to sane minds a healthier one to achieve this aim by allowing Justice to take its normal course. Dr. Bukola Saraki, against all odds, has continued to ensure that the promises Senate made to the Nigerian people are kept to the letter. The Senate, under Saraki is leaving no stone unturned in making sure that Nigerian citizens get the best. This is the first time ever that the nation is concluding the constitution amendment process long before the election year so that people can objectively participate in the process without looking at the partisan benefits. 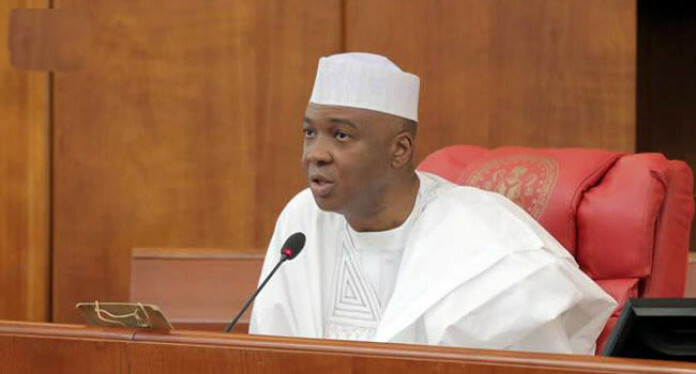 Saraki’s Senate has assiduously worked on the key areas of consideration in the Constitution Amendment Report, which includes 27 different Bills, include a Bill to decongest the Exclusive Legislative List by transferring certain items contained therein to the Concurrent List, thereby enabling the States to make laws in respect of those items; a Bill to alter the Constitution to abrogate the State Joint Local Government Accounts and empower each Local Government Council to maintain its own special account; and a Bill to provide the Independent National Electoral Commission with sufficient time to conduct bye-elections and provide grounds for de-registration of political parties. Others are a Bill that seeks to alter the Constitution to provide for the timely passage of Bills; a Bill that seeks to alter the Constitution of the Federal Republic of Nigeria to provide a timeframe within which the President and Governors shall forward to the Senate or the State House of Assembly names of nominees for confirmation as Ministers or Commissioners; and a Bill to alter section 147 of the Constitution of the Federal Republic of Nigeria, 1999 to provide for the appointment of a Minister from the FCT, Abuja to ensure that FCT is represented in the Executive Council of the Federation. campaign, is still and has always been a part of the Constitution Review has also been passed into law, thereby dawning a new political era for the country’s youth population. Osun State Broadcast Corporation Man of the Year 2006; ‘African Governor of the Year in Agricultural Development’ by African Union Media Group in Pretoria, South Africa; Nigeria Referee Association Grand Patron 2007; This Day Newspaper Best Governor on Food Security 2008; ‘The Friend of Nigerian Youth; Doctor of Science and Public Administration Award’ by University of Port Harcourt for his Administration’s focus on Agriculture; Life Fellowship of All Nigeria Confederation of Principals of Secondary Schools, (ANCOPSS) 2009; Outstanding Governor on Energy 2009 by the Nigerian Compass; Emerging Tiger of Nigeria (Leadership Award by This Day Newspaper) 2010; Institute of Chartered Accountants Award of Excellence 2010; Nigerian Bar Association Award of Excellence; Award of Excellence in Development of Education and Health care delivery in Nigeria by the College of Medicine, University of Lagos 2012. In furtherance of his passion to serve the people of Kwara State and in particular, Kwara Central Senatorial District where he hails from. Dr. Bukola Saraki was elected as a Senator in 2001 with overwhelming electoral votes. On his assumption as a Senator of the Federal Republic of Nigeria, he was appointed as the Chairman, Senate Committee on Environment and Ecology. His legislative interest also includes the area of Health, Agriculture, Education, National economy and Environmental policy. Senator Saraki is also a member of the Senate Committees on Capital markets and Finance. Out of his vision to ensure good governance, Senator Saraki sponsored a motion on the floor of the Senate on the need to end the fuel subsidy regime in Nigeria which has been a source of conduit pipe and wastages of national resources. Amongst other motions and private member bills, he has sponsored includes: the National Oil Spill Detection and Response Agency Amendment Bill 2012 which is aimed at putting a halt to oil spills in the Niger Delta, the Gas Flaring Prohibition Bill 2012, and a strong supporter of the Climate Change Commission Bill 2013. Kenneth Kaunda Foundation Best Governor in Africa in 2006; Osun State Broadcast Corporation Man of the Year in 2006; ‘African Governor of the Year in Agricultural Development’ by African Union Media Group in Pretoria, South Africa; Nigeria Referee Association Grand Patron 2007; This Day Newspaper Best Governor on Food Security 2008; ‘The Friend of Nigerian Youth; Doctor of Science and Public Administration Award’ by University of Port Harcourt for his Administration’s focus on Agriculture; Life Fellowship of All Nigeria Confederation of Principals of Secondary Schools, (ANCOPSS) 2009; Outstanding Governor on Energy 2009 by the Nigerian Compass; Emerging Tiger of Nigeria (Leadership Award by This Day Newspaper) 2010; Institute of Chartered Accountants Award of Excellence 2010; Nigerian Bar Association Award of Excellence; Award of Excellence in Development of Education and Health care delivery in Nigeria by the College of Medicine, University of Lagos 2012.